Caffeine slightly reduces calcium absorption in your bones, but not as drastically as early reports suggested. Moderation appears to be the key, and adding more calcium to the diet offsets caffeine’s impact. One study suggests that adding a tablespoonful or two of milk to your coffee is enough to replace the lost calcium. So this may be a good reason to indulge in a frothy cappuccino rather than straight espresso. 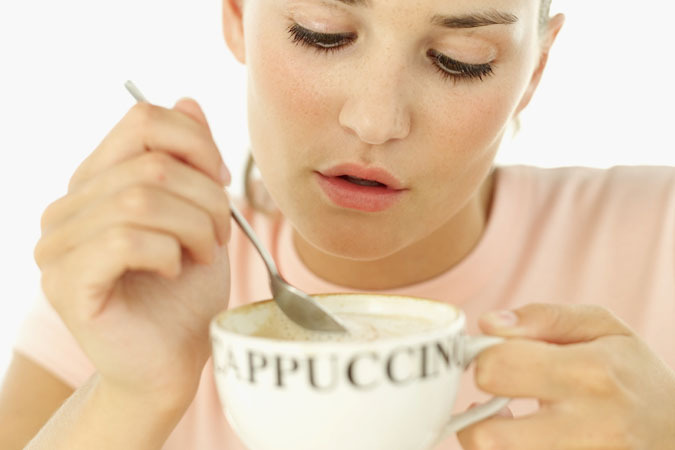 Drinking more than three cups of coffee every day may be harmful to bone health. You can replace caffeine’s calcium loss by getting enough calcium to meet your body’s needs. The phosphorous in soft drinks may also contribute to calcium loss. There’s no need to give up caffeine, coffee, tea, and chocolate – they appear to have many benefits, from preventing certain cancers to boosting our bodies with antioxidants to possibly reducing the risk of Alzheimer’s and dementia. But when it comes to bone health, experts say large amounts of caffeine are not advisable, especially among post-menopausal women. In one study of nearly 500 women, aged 65 to 77 years old, high amounts of caffeine (more than 300 mg daily, or about three cups of coffee) appeared to significantly accelerate bone loss at the spine. Plus, women who shared a particular genotype experienced the highest rate of bone loss. Other studies have a found that a gene that codes for the vitamin D receptor also impacts caffeine levels associated with caffeine. So as we’ve seen before, a person’s genetic make-up plays a role in caffeine’s impact on the body. If you’re a moderate caffeine consumer, you may want to boost calcium just a bit. For more information, check out this page by the National Osteoporosis Foundation.